This morning, we kicked off day three of the Flock and Rally Annual Winter Company Retreat on Isla Mujeres, Mexico with a trip to the cochinita pibil man at the public market. First, we took a company photo to commemorate the occasion. That's Cancun in the background. We are far from there, on lovely Playa Norte, on an island whose southern tip is the easternmost point in Mexico. Super rad. The cochinita pibil vendors are only at the public market on Sunday mornings, although the breakfast and lunch places out front are open daily. Our favorite cochinita pibil vendor is from Valladolid, the original home of the sour orange + achiote suckling pig, roasted in banana leaves, that is such a Yucatecan culinary standard. Cochinita pibil is basically pulled pork, but the juiciness and savoriness are far beyond most Carolinian varieties. Sorry y'all, but it's true. Rick Bayless may be too famous a chef to have any hipster cred, but I did a big Mexican recipe project for a client in the mid-00s, requiring me to review a lot of his recipe work, and I learned that his recipes are pretty authentic, almost on par with the demi-goddess of Mexican recipe writing for Anglos, Diana Kennedy. The guy at the Isla Mujeres public market is the o.g., and if you don't get there by 9 on Sunday morning, you're SOL. Last year, we got there at 7:30am and had unlimited pork magic access. This year, we got there on the late side and were able to get plenty of tasty, tiny tacos from the magic man -- but there was not enough pork to get a kilo to go. Oh, and those tortillas? So hot and fresh from the tortilla press that they were uncomfortable to hold in one hand for very long. Props to Debi's man Derek for carrying them back to the condo at Ixchel for us. 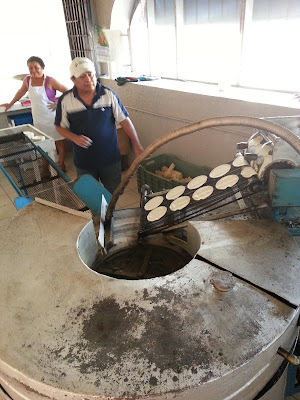 Loud machine, cheap tortillas! Our stack, above, cost 10 pesos (that's 8.5 cents at the current exchange rate, roughly). Now that we've had tacos, we're getting some work done. Our penthouse roof garden makes a swell office. This is where we hang out at night. Big ups to Rod at the Ixchel Beach Hotel for helping us select the unit with the new hot tub, which actually gets hot up to 100 degrees -- unlike pretty much every other hot tub on the island. Roof access via spiral stairs. Time to start on some of those fresh juices. With a little Corralejo reposado tequila thrown in. After all, it's 5 o'clock somewhere. So no Merida? I am still jealous! Isla Mujeres is just too fab not to hit again. The more we talk with people here the more we learn what a special island it is. Got some great dirt the other night from a millionaire yacht owner and his girlfriend about how if you get thrown in jail on Isla, it's not so bad. Get thrown in jail in Cancun, and that's another story entirely. Ha!